Smithfield’s once famous “Suicide Bridge” was the last stop for those who wanted to cross into the great beyond. It was just before Christmas in 1920. As snow flurries blew about, a man stood atop a bridge on Farnum Pike contemplating his next move. Hours of quiet desperation had all come down to this. The dark water of the Woonasquatucket River mocked him as it swirled below, almost daring him to jump. Others had occupied the same spot where he was standing, and for the same purpose, just waiting for the right moment. Then, almost without thinking, he leaped from the bridge and into eternity. The following morning when police recovered his body, word spread quickly that the Suicide Bridge had claimed yet another victim. This is the story of Smithfield’s infamous “Suicide Bridge”, a wrought iron structure that once spanned the Woonasquatucket River connecting Georgiaville to Esmond. Its ominous reputation was so well known that even newspapers and town death records referred to it by that name. By all appearances it was no different from other bridges around the state, and hardly seemed like the type of structure to inspire myth and legends. Long-time area residents will tell you that the bridge’s name came about due to the many suicides that occurred there; sometimes, they say, at the rate of once a month! However, official town death records show those numbers to be much lower, thereby indicating that once a month is more myth than reality. Like many legends, the story of the bridge has grown with each re-telling. Looking down from the present-day bridge that spans the Woonasquatucket, one may find it hard to believe that it was even possible to end one’s life by jumping, but apparently it was. At one time the Esmond Dam kept the water level higher and therefore deeper. The old bridge sat at a higher elevation and the road went up to meet it. One man who grew up in the area recalled how the wide open areas on either side of the bridge allowed for ample swimming in summer, and hockey games in winter. Today, with the water level kept lower, these areas are choked with brush and weeds. The structure that later became known as the Suicide Bridge was built in 1890 to replace an earlier one that stood at the same location. The old bridge was unsafe, and was dismantled after a horrible accident involving a horse and buggy had occurred there. The new bridge was “state of the art” for its day. The iron trusses allowed for flexibility and the even distribution of weight. The anchor bolts holding fast to the massive granite stones on either shore ensured it could withstand just about anything Mother Nature could throw at it. The only design flaw was that it was too narrow because it was built before the invention of the automobile, when traffic moved at a leisurely 3 to 5 miles-per-hour. The early “horseless carriages” came into use about 1905 and puttered along with tiny engines. They weren’t much larger than a typical buggy, and didn’t take up much of the highway. However, as the Twentieth Century moved forward, larger and faster vehicles took to the road, and it became apparent just how narrow the bridge was. This fact made for some hair-raising experiences when two autos came to meet at the bridge. Common sense dictated that one driver stop and wait for the other to cross first, but good sense and pride don’t always go together, and over the years numerous games of “chicken” ended badly. Exactly how many deaths occurred at the bridge is unknown as town death records don’t list locations until the early 1900s, but as near as can be determined, the first suicide occurred at the bridge on May 31, 1914, when a 54 year-old woman leapt into the water. Two years later, a middle-aged man followed suit in what was described as a “fit of insanity”. Four more deaths occurred at the bridge in 1917, and yet another in May of 1918. Not every death connected to the bridge was a suicide; some were accidental drownings. In the days before backyard swimming pools and easy transportation to the state’s beaches, people swam in local lakes and rivers. Drownings occurred in virtually every body of water throughout Smithfield, but when one occurred at the bridge, people took special notice. With each death reported, the bridge’s reputation grew. Some said the bridge was cursed, or somehow had a dark force connected to it that inspired people to jump. Teenagers told ghost stories of the bridge being haunted by the tormented souls of those who had died there. Whether one believes in such things or not, there were those who avoided the bridge at night – just in case. After a man drowned himself at the bridge just before Thanksgiving in 1921, things seemed to quiet down, and no further suicides were reported there for the rest of the decade. Some no doubt felt that the jinx had been broken, but it was only lying dormant. It was an accident that brought about the construction of the Suicide Bridge, and it was another accident that caused it to be dismantled. In the early morning hours of January 20, 1932, a car carrying two young men crashed through a guardrail at the bridge and tumbled into the icy water. One man managed to free himself, but the other drowned. Afterwards, plans were begun to replace the bridge. The last known death to occur at the bridge happened on February 20, 1933, when a man was struck and killed by a passing automobile. 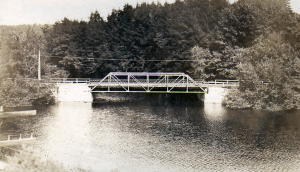 The new bridge was completed in 1934 and is still in use today. Hundreds of motorists cross it daily, never realizing the dark past of its predecessor. Since its completion, there have been no reported suicides at that location. However, that’s not the end of this story, for the old Suicide Bridge is still in use today! Once it was dismantled, it was brought to Harrisville and re-assembled over the Nipmuc River on Sherman Farm Road, and re-named the Shippee Bridge. The bridge is open to two-way traffic and has a walkway for pedestrians. Although the occasional car accident still occurs on the bridge, there have been no serious incidents, and no reported suicides. A modern chain link fence runs along the walkway that prevents people from jumping.